Star Scissors is a company which manufactures scissors, using innovative techniques and finest materials which are available today. The result of this manufacturing process is lightweight, perfectly balanced and ergonomic shears which ensure smooth, precise and fast hair cutting. Each pair of scissors is created, using experience from years of testing, researching and studying, as well as goes through 93 steps of control to provide perfection. These hair cutting and hair thinning shears from Star Scissors are made of high quality Japanese J2 stainless steel which is known as durable and long-lasting material. Hair cutting scissors have razor edge convex hollow ground blades which are extremely sharp blades for nice and clean cuts, but hair thinning shears have one convex edge blade and one 34 micro-teeth blade, as they are made for hair thinning. Both of them are 6 inches long. Other features of these hair scissors are screw of tension adjustment which offers great required tuning. Another useful feature of these shears is removable finger rest for comfort and ergonomics which can be removed, if it seems interfering. They also have removable finger inserts which help to adjust the size of finger holes for better fit and comfort. This Star Scissors set includes one piece of hair cutting scissors, one piece of hair thinning shears, as well as black synthetic leather storage case for safe and comfortable movement. As these Star Scissors shears are made from Japanese J2 stainless steel, they are silver color with mirror sheen. Their shins are curved, adding interesting and stylish look, but their finger sizing rings are black, made from rubber. Also their tension adjustment screws are some kind of design elements, because they have tiny serrations and black lines. As one might guess, hair cutting scissors are meant for hair cutting, but hair thinning shears are meant for hair thinning. 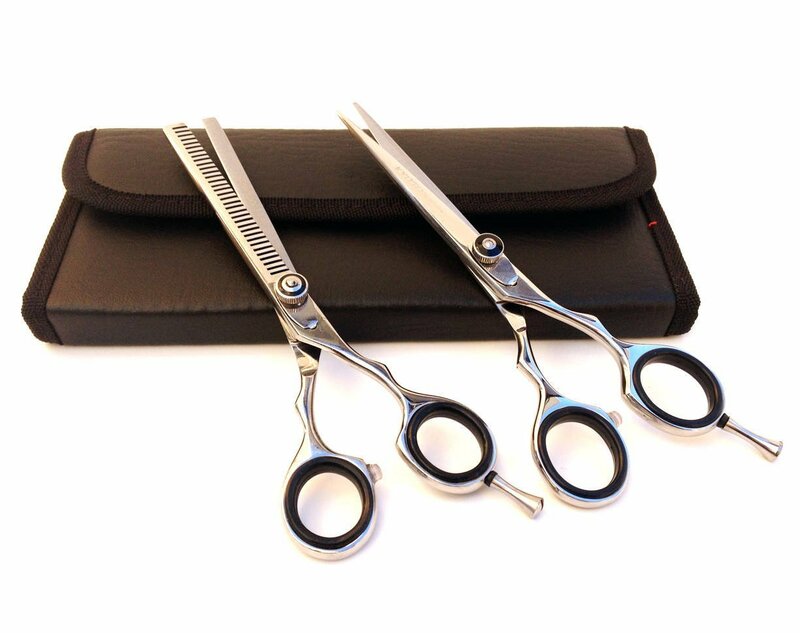 Considering that these hair cutting and hair thinning shears from Star Scissors have high quality and all of necessary qualities, they are suitable for professional usage in hair salons, but they can be used by amateurs at home as well, unless they can afford them. These hair cutting and hair thinning shears from Star Scissors set are made of Japanese J2 stainless steel. Cutting scissors have razor edge convex hollow ground blades, but thinning shears have one convex edge blade and one 34 micro-teeth blade. Both of these hair shears are 6 inches long. Their design can be characterized by polished silver, curved shins, black finger inserts, as well as stylish tension adjustment screw. As mentioned before, these hair scissors have tension adjustment screw, removable finger rest and removable finger inserts. This Star Scissors set includes not only cutting and thinning scissors, but also black synthetic leather storage case. This Star Scissors product is suitable both for professionals and amateurs.